As a promising young demon hunter, you are prepared to take on adversaries from the underworld, but when an ancient Egyptian artifact shows up on your doorstep heralding the return of Seth, a demon scourge as old as evil itself, you find yourself facing the most dangerous challenge imaginable. The encroaching darkness threatens to swallow all light spanning time itself! Can a mere mortal really hope to contend with such power? Find out in Demon Hunter 4: Riddles of Light! Confront the ancient demon Seth! Demon Hunter 4: Riddles of Light is rated 3.3 out of 5 by 8. Rated 5 out of 5 by sadcypress from Best Game on BigFish I've bought a shameful amount of games on BigFish because these hidden object type games with the other puzzles are my addiction. THIS one, was beyond my wildest expectations. The scenes are incredibly beautiful. The artwork is splendid, and done so carefully as to resemble actual ancient Egyptian jewelry, amulets, cartouches, dwellings, artifacts, foods, alchemy, and clothing. Though not said, the period represented is Tel el Amarna. The tie-in with the demons reminded me of the movie The Mummy. I love the puzzles in this particular game as well, very intriguing. I'll say that at first, I thought this game would be too easy because it starts out that way. But that wasn't the case, since it becomes more difficult as each scene is opened. If the makers of this game would add to this Egypt collection, I'd definitely buy it. Right now, I'm off to search out more Demon Hunter games. Rated 5 out of 5 by 2bees1 from Great Game You would think that "saving the world" games would get old after a while, but this one is particularly good. There are lots of different kind of puzzles, nothing boring. The games are not easy, although I was able to get some of them, but someone with better skills than I would probably be able to do them all. If I had any criticism it would be that your reflexes really do matter and you had better have them honed. The "shooting" portion was difficult for me as my reflexes aren't what they once were but the game is very forgiving and you get plenty of chances to get it right. All and all, this game is well worth the price. I'm assuming these are new developers since there wasn't a "collectors edition", but this was a really good effort and probably worth more than the price. I was one of the beta testers on this game, it seems like it was months ago. I'm really glad I bought it. Rated 5 out of 5 by DeadRiver from Great Game For Hidden Object Adventure Lovers Based on the Demo. I really enjoyed this SE game. There were 4 types of hidden object games; 1. the dialogue type where I had to find the objects from the key words highlighted in the dialogue 2. the picture type where I had to find objects where the clues were silhouettes 3. the list type which I enjoyed the most and 4. fragmented hidden object pieces to make the object. 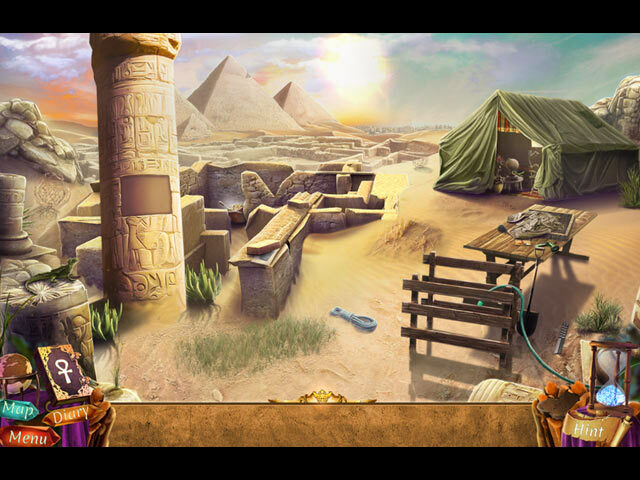 The hidden object games were interactive with morphing objects in many of them. The mini puzzles were a lot of fun, some of them very puzzling. Graphics were great. The soundtrack was excellent, with eerie music and excellent easy to understand voice overs. The story line was great. It took place in two time periods, with a portal to connect them. Objectives were easy to follow. It was an immediate buy for me. Rated 3 out of 5 by biscuitsmama from CAN YOU SAVE AUNTIE DAWN? OH AND WHILE YOU ARE AT IT SAVE THE WORLD AS WELL! Another game, and yet another evil spirit attempting to take over the world. 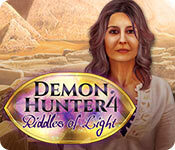 Demon Hunter 4: Riddles of Light is the latest game in the series and in this game you must rescue your Aunt Dawn from the clutches of the ancient Egyptian God Seth. Of course with the series name being Demon Hunters I would expect nothing less than some sort of evil demon as the subject of the game. The game is really a mixed bag as far as graphics with some being exceptionally good and others being downright poor in quality. I didn’t care for the artistic style of the game that uses live characters along with their computer generated depictions. The voiceovers are not always lip-synced and I hate seeing a character stand and stare with no lip movement when they are speaking. At least in the demo version of the game, the Strategy Guide must be accessed by selecting the menu button. Since I haven’t purchased the game I am not sure if that will change in the full version of the game. I personally do not think the game is worth the full CE price so will wait until there is a great sale before purchasing the game. I also dislike the fact that unless I purchase the game I am unable to access the collectibles in the guide. The developer did make an effort with the HOPS by making them interactive and a bit creative but with the grainy quality of the scenes the items are difficult to find. I dislike it when a developer uses brighter rays of light in one area of a scene and that makes items difficult to spot as well. Thankfully there is a matching game that can be played if you don’t want to search for items in the HOP. I did not understand exactly what I was supposed to do to solve several of the puzzles. I would prefer having more clear-cut instructions. One puzzle early in the game has a code to use and it took me a minute or two before I realized what I should do. 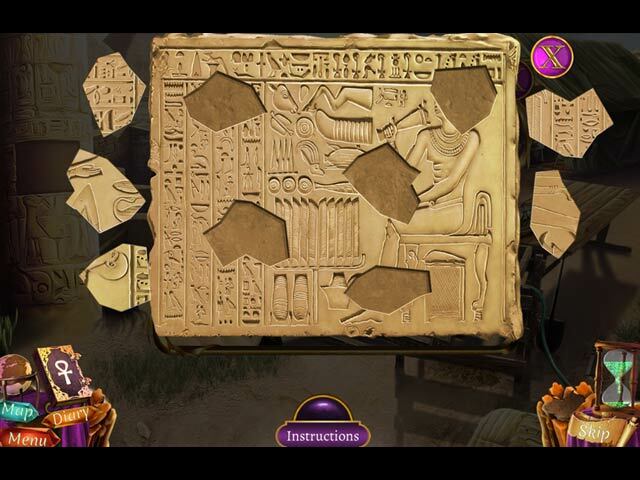 Your tools include an interactive map and the Gauntlet of Horus. The CE version of the game includes Morphing Objects in the HOPS, Collectible Stars and Diamonds, Achievements to earn, Wallpapers, Concept Art, Bonus Chapter, and Strategy Guide. The developer has also provided the ability to replay some HOPS and Puzzles. Although the game does get more interesting as we approach the end of the demo, my disappointment with the graphics and the HOPS make it unlikely that I will purchase the game. Even though I am not over-the-moon thrilled by the game, it might be a perfect game for you. Please try the demo to see what you think. Happy gaming! Rated 2 out of 5 by LikeAGoodStory from Definitely Try the Demo and Read the Reviews Other reviewers have done a great job of describing the storyline so I am going with the reviewer who thought the storyline was all over the place. It was. Perhaps what is so disappointing is I love this series, and this game is a part of it in name only. For me, the demon connection to the Egyptian mythology just doesn't make it, as accurate as the mythology may be. Big Giant games is a favorite developer of mine but again, this game doesn't measure up to their usual offering. The mini games are in short supply and some are not puzzles at all. 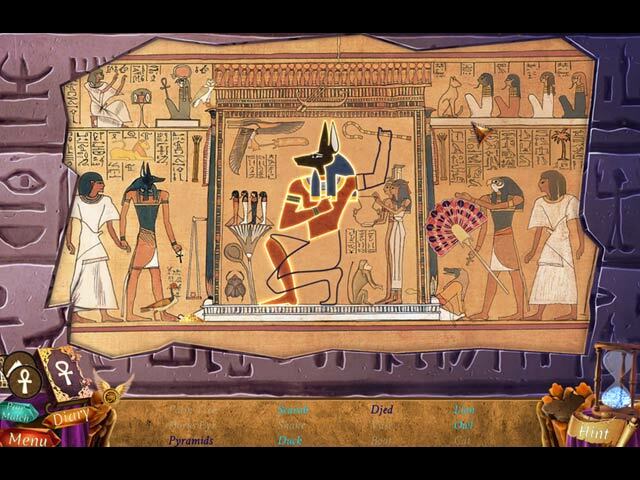 The game dwindles to find an object, then maybe a puzzle or interactive HOP (most of these pretty good) in order to finally put together the soul of Horus, with an occasional visit by a demon. The graphics range from stunning to average, again not typical of this series or the developer. All of this said, this game might be for you so try the demo and read the reviewers of those who really liked the game. This review is based upon completed play of the game. Rated 2 out of 5 by Granny_Gruff from Isn't there a song: "And Another One Bites the Dust?" In the opening of the fourth game in the Demon Hunter series, Dawn, our former demon hunter, and her niece, Lila, are commenting on a newly found legendary artifact in Egypt. Within moments there is a ring at the door and the game is afoot. Someone wants Dawn and Lila in Egypt to save the world from evil ancient god, Seth. You, playing as Lila, will save the world from destruction as niece Lila is now the actual Demon Hunter. Good Stuff: Some of the artwork is very well drawn. There are several types of HOPs with a matching pairs game alternative. Bad stuff: Some of the artwork is blurry and characters are stationary. The HOPs are easily solved. And then there were the mini-games. Most of what might have be referred to as the mini-games were so simple there were no instructions. You just click around and you are done. And those that had some instructions or a code/solution were not quite as advertised. Case in point: There is a large poster on the wall of Aunt Dawn's tent depicting a Bedouin in full desert regalia. When it comes time to get dressed like that, you can't! Even though all the items on the poster are in the tent, you need to pick other assorted items to be able to get past that point and leave! And then you walk out into a sand storm! You quickly catch up to Seth, who has Aunt Dawn in his clutches - apparently he will wait for you to keep up as you will need to do so again. Bottom line: I don't care. If I wanted some twisted story of Egyptian mythology, there are plenty of bad ones out there that will at least stay closer to historical details. If I wanted to save the world again, there are better games available with at least a little challenge. (The only slight brain activity here came in a cartouche game in a storage room in the temple Seth stole in the past.) Once again, I will repeat: Play the demo. Know what is being dumped on you. Purchase wisely so that the next game may be better. Do not reward ineptitude! Rated 1 out of 5 by anntxlady2004 from A Dud I have liked the previous Demon Hunter games, so decided I would buy this one. Mistake! Too bad you can't return them. It is BORING. Took several days to complete as it does not hold my interest.